Renowned Middle Eastern artist, Rashid Khalifa, opened his newest works up to the public at the Saatchi Gallery in west London on October 3rd. The exhibition entitled "Penumbra: Textured Shadow - Coloured Light" actively encouraged the visitor to go on a journey and engage with the pieces by moving around freely and seeing what was presented to them from different angles. When asked about his approach, the artist explained his main inspiration for the exhibition was the idea of 'Mashrabiya'. The Mashrabiya is an architectural element, which is characteristic of Arabic residences and serves several purposes. It is a type of carved wooden oriel window that helps reduce direct sunlight while allowing a breeze in and gives occupants a good view of the street without being seen. For his newest exhibition at the Saatchi Gallery, which was curated and produced by Eva McGaw and Tatiana Palinskasev, Khalifa created ten pieces that were showcased over two rooms. 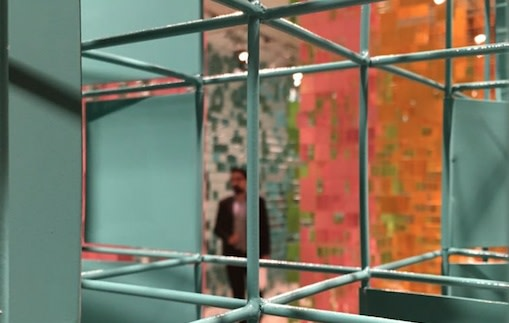 When first entering, the visitor is met by mobile columns made of metal in pink, green and blue. When seen in pictures these columns seem less impressive, softer and more filigree, assembled with occasional little squares. However, in reality you can immediately sense the reassuring solidity and strength of the metal with the bigger squares being the size of the palm of the hand.